Structural elements of the Bonaparte Basin showing the locations of the Puffin Field and the Cartier 3D Seismic Survey. A deghosted pre-stack depth migration processing workflow has resulted in significant enhancement to the data at Puffin Formation level, as well as unprecedented imaging of Triassic structures and superb resolution and internal geometry definition at Permian level. Additionally, new play types such as potential onlap traps and Paleocene basin floor fans can be confidently mapped on the new dataset and far angle imaging has provided for the first time a tool for calibrated direct hydrocarbon detection. The seismic line below appeared as a multi-page pull-out feature in our print magazine. To subscribe to the print magazine use the 'Print Subscription' feature in the menu at the top of this page. Arbitrary line through the reprocessed dataset illustrating the enhancement at Puffin Formation and Keeling-1 gas discovery levels as well as the new play types revealed by improved imaging. Improved seismic resolution has been key in reviving interest in the Vulcan sub-basin. Exploration in the Vulcan sub-basin, located offshore Western Australia, has been relatively slow since the 1990s. However, a deghosted pre-stack depth migration processing workflow is proving to be essential in gaining a better understanding of the area and mitigating the main risks in trap definition, structural evolution and thin reservoir identification. The Vulcan sub-basin is a north-east-trending Mesozoic extensional depocenter in the still largely frontier Bonaparte Basin. It comprises a series of horsts, grabens and terraces hosting a combination of structural and stratigraphic traps such as tilted fault blocks, horsts and lowstand basin floor fans. It is estimated that the Vulcan sub-basin contains reserves of 388 MMb of liquid hydrocarbons and 1.3 Tcf of gas. 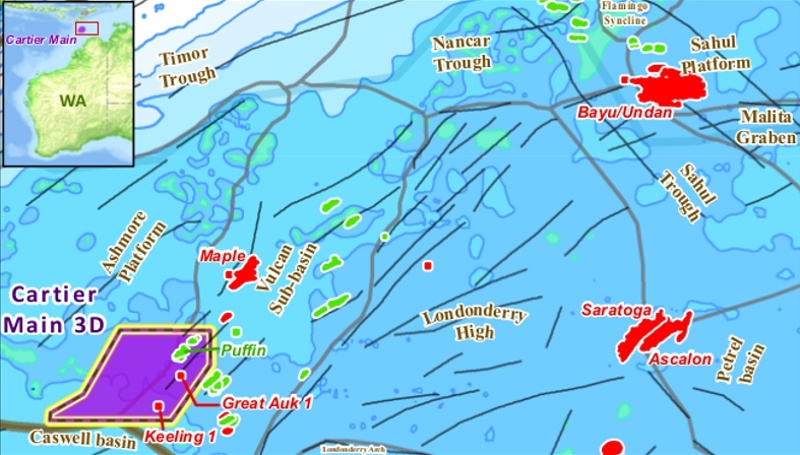 The Puffin Oil Field is situated in the Ashmore Cartier Exploration Permit area within this sub-basin (see map above). As it has produced light, sweet crude with an API of 43.8 degrees, it is no wonder that subsequent exploration in the Vulcan sub-basin primarily targeted similar structures in the Puffin Sandstone. In order to address the remaining exploration targets, Spectrum’s 2,770 km² multi-client Cartier 3D survey was acquired in 2010, providing the framework required for a more detailed regional evaluation of the Upper Cretaceous submarine fan sandstones of the Puffin Formation and to evaluate the additional potential of possible deeper Triassic and Permian plays. Due to the relatively complex geological and structural setting, even this relatively modern 2010 3D dataset did not sufficiently manage to address the main geological risks, such as seismic trap definition, retention of hydrocarbons in tectonically reactivated structures and identification of thin reservoirs. The survey was therefore reprocessed through a deghosted pre-stack depth migration workflow, achieving extremely significant imaging uplifts, which have subsequently increased the geological understanding of the area and are expected to have a gamechanging impact on future exploration in this region. The reprocessing had specific targets aimed at enhancing prospectivity at various objective levels. For the Upper Cretaceous Puffin basin floor fan sands play, improved demultiple and deghosting was designed to image individual sand packages, while depth migration was expected to improve poorly imaged structures affected by ray paths through faults and major velocity breaks across faulted sections. Also, with historically poor far angle imaging, the reprocessing focused on getting far angles flat and imaged correctly for possible hydrocarbon detection through calibrated AVA anomaly evaluation. Original processing, showing evidence of horst and graben structures (blue rectangle) and Permian (red rectangle) intervals. 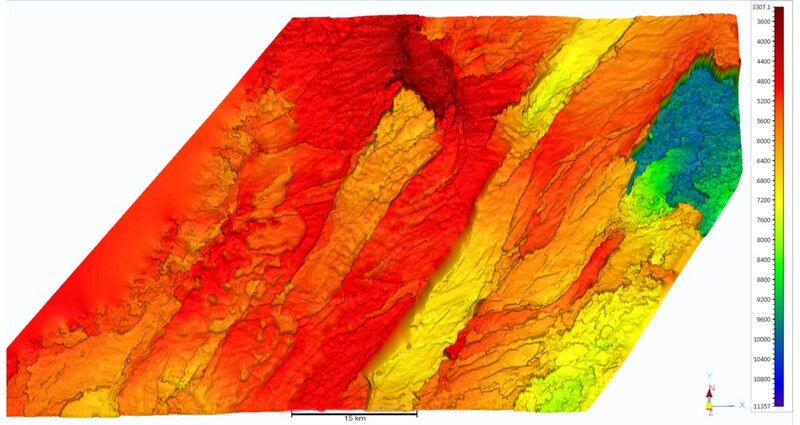 Reprocessed dataset, showing clear improvements in imaging of horst and graben structures (blue rectangle) and Permian (red rectangle) intervals. Structures in the Triassic just below the Base Cretaceous Unconformity could be structurally mapped on the original dataset. However, Triassic faulting is complex and historically has been uninterpretable. The new demultiple and deghosting techniques employed here resulted in unprecedented improvements at Triassic level, as can be seen on the images above. Detailed attention to velocity analysis also made a big difference in improving the stack response of critical reflectors. Triassic targets have typically been explored based on the structural configuration at Base Cretaceous Unconformity level. The reprocessed example (above) shows a Triassic horst (blue rectangle) not previously identified as it lies under a Base Cretaceous syncline. The improved image within the Triassic interval means not only that an intra-Triassic marker, appearing to be equivalent to the prospective Nome Formation, can now be mapped confidently, but also that possible Jurassic sections containing potential seals above these horsts can also be inferred. 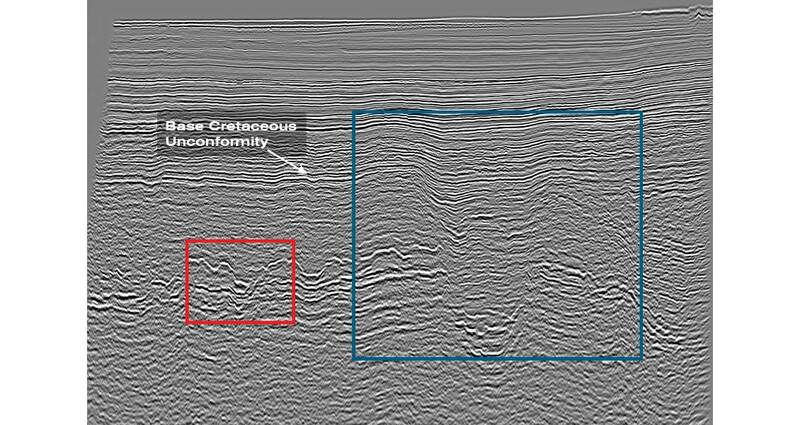 Several of the horst blocks also exhibit seismic amplitude anomalies confined to structural closures that could relate to the presence of hydrocarbons. Even when the Top Permian horizon is reasonably clear, this potential play has been very poorly understood. Significant improvements at Permian level have been achieved predominantly through the recovery of low frequency as well as pre-stack depth migration where complex velocity boundaries and structural geometries have caused imaging issues in the previous pre-stack time migrated data. Top Permian character is clearer, more continuous and imaged with a greater bandwidth. Abundant potential structures can be seen from the mapping of the top Permian in 3D, many of which sit within 3,000–4,000m below sea level range. Further analysis of seismic attributes will determine the viability of these closures and potentially their porosity distribution, with a view to possible drilling. Permian potential reef play horizon, highlighting potential carbonate build up distribution. 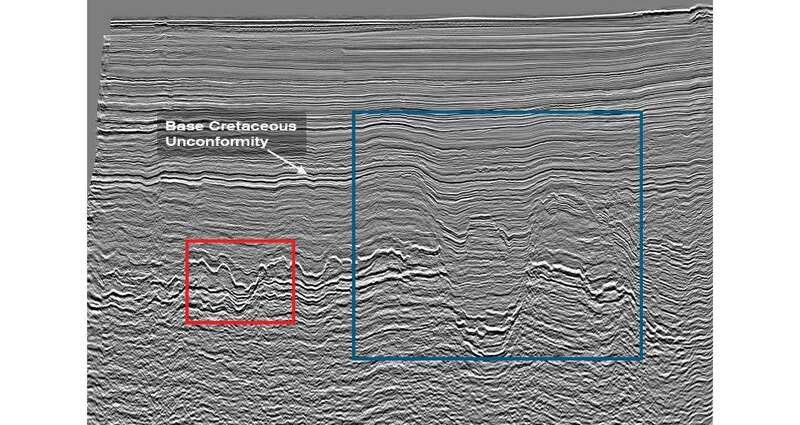 The reprocessing workflow employed not only had clear outcome objectives identified from the start, but also integrated all available data with a very strong understanding of the geological and structural challenges related to seismic imaging. By continuously tying interim tests to expected results, it was clear before the final results were obtained that the interpretation of the Puffin Formation was going to be greatly enhanced by improved multiple attenuation and detailed attention to velocities. More advanced attribute work such as continuity attribute (similar to coherence) applied at Puffin sandstone level has revealed a series of channels and fan-like geometries explaining some negative well results. In addition, frequency decomposition applied at Puffin, Triassic, Paleocene fan and Permian carbonate levels, together with structural imaging blended with the frequency decomposition information, have all provided further insights into the data. At Puffin and Triassic levels, frequency responses expected of hydrocarbon accumulations, calibrated with wells in the area, have been observed; Paleocene fan geometry has been interpreted for a pinch-out play at Paleocene level; channel and karstic-like features have been mapped at Permian carbonate level and angle stack analysis has shown increase in positive amplitude value with angle at Puffin and Triassic levels. This dataset will allow the area to be more fully understood by providing a reliable tool for post well analysis, prospect de-risking and high grading of new plays. So far it has already provided a true game-changing tool for exploration in this section of the Vulcan sub-basin. Geoscience Australia, 1996, Exploration and Development History: Peter Barber Vulcan Tertiary Tie Study. Canberra: Australian Government. 17-22. Ozdemir, A. Ozbek, A. Caprioli, P. Robertsson, J. Kragh, E., 2009, SEG Houston 2009 International Exposition and Annual Meeting, 147-151. Ahmad M and Munson TJ, 2013. Chapter 36: Bonaparte Basin: in Ahmad M and Munson TJ (compilers). ‘Geology and mineral resources of the Northern Territory’. Northern Territory Geological Survey, Special Publication 5. The integration of several data sets will be essential for hydrocarbon exploration in the Hoop Fault Complex area of the Barents Sea.